As I mentioned before, I grew up going “to the shore” for our annual summer vacation. Two glorious weeks in Sea Isle City, NJ. It really was the most innocent time in my life. During the day, my siblings and I would swim in the salty goodness of the ocean, feed (or get attacked by) seagulls, build drip castles (mine were best! ), and eat peanut butter and jelly sandwiches which always managed to have sand in them, too.When we tired of the beach, we would attach playing cards to the spokes of our bikes with clothespins and ride all over the island in search of penny candy or soft-serve. At night, our family would go out to dinner or drive up the island to the boardwalk in Ocean City, NJ. 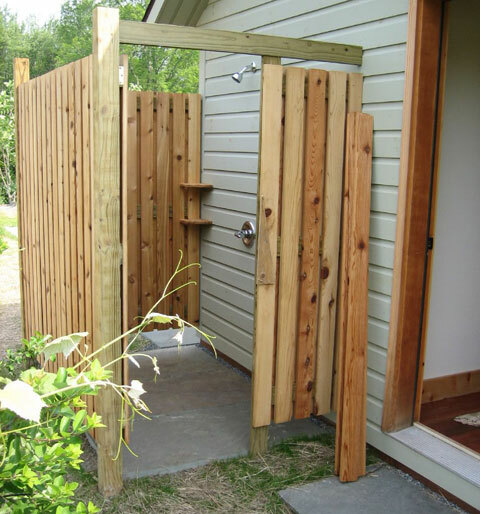 Part of the getting ready ritual always involved an outdoor shower. I looked for pictures of some on-line. This one is the closest I could get. All of the houses we rented had an outdoor shower. None of them were this nice! Picture more rickety wood, chipping white paint, and pure vacation perfection. Blue sky above you, salt air, the roar of the waves in the background, and your favorite shampoo all mingling together. The best part of the outdoor shower was taking one at night. Replace the blue sky with stars…ahhhhh! Now that I am older, I think all future outdoor showers will involve cold beer or red wine to complete the sensory experience. I live in Michigan now. While there is no ocean here, we do have a pretty big lake that has just as much to offer, minus the salt. My new favorite place is Pentwater, MI. It is a small, lake town with a quaint main street, no chain restaurants, lots of bikes, and places to make memories with your family. Through the very generous help of some family friends, my husband and I recently purchased a rental cottage business in Pentwater. Check out Hilltop Cottage here! When our son was in treatment, we could not go anywhere or do anything. Ever. The summer of 2010 marked the beginning of us reclaiming our new life. We did everything that summer that we couldn’t do during treatment, including swimming in that gorgeous Lake! That summer, we discovered Pentwater. The goal in purchasing this home is to give families who are just coming off childhood cancer treatment a week’s vacation at the lake. The best parts of Hilltop Cottage are the front porch and screened in patio on the side of the house. There are comfortable chairs for rocking, speakers for the tunes, and hopefully, lots of family and friends for conversation and laughs. I will always be within driving distance of water! It is good for my soul.